I lengthened my morning walk today. Slightly further round the outskirts of the hill. More views. Came across an enormous, gentle tethered horse calmly ignoring the yappy little dog jumping around its legs. Just below the escarpment were various signs of work-in-progress – a new corrugated iron roof on a donkey shed, a new fence around a chicken coop, half a pallet of bricks for something, general improvements going on. Some chickens were scrabbling around for food – not scrawny things but huge plump ones, mostly shiny black, a few white, one golden. Behind them, emerging blinking into the early sun from its whitewashed stone hut, was what appeared to be a llama. With silly jokes running round my head (“¿Como se llama, llama?”) I looked for a way to get closer. From the track on the other side, its body looked more like a sheep but with a ludicrously long neck. With the creature still unidentified, I continued exploring, unsure quite where the path would end up. With the sun getting warmer and a sudden steep rise ahead, I turned in from the perimeter and cut through an alley to find myself on Calle Laurel. 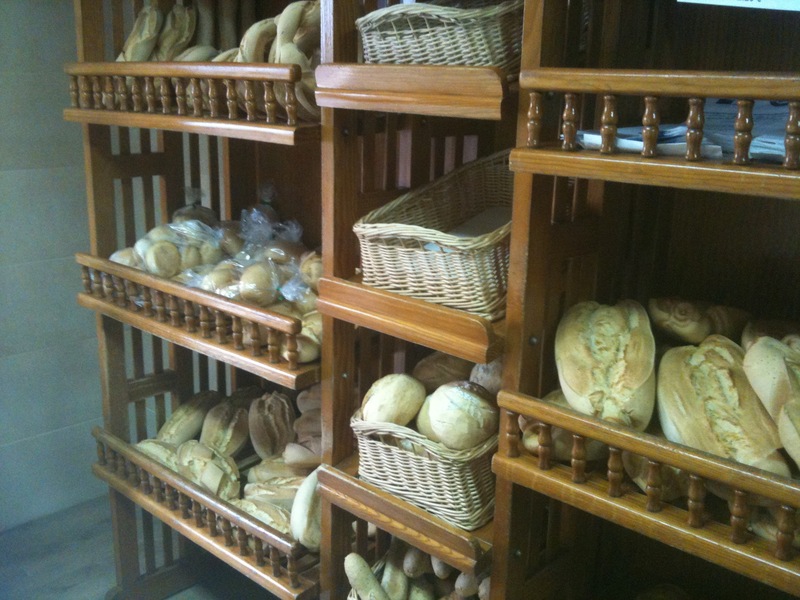 Ah good, just a little bit higher up from my second-favourite panadería. Avoiding the spray as an old man washed his truck, I decided to treat myself, so diverted round to my most favourite panadería. I chose something equally as unidentifiable as the llama/sheep, but looking like flaky pastry decorated with a cross of custard, topped with a slice of orange. “One of those please,” I indicated. “Only one?” she replied, placing it on the scales to weigh it before wrapping it beautifully for me. “Sesenta y uno” she said – 61 centimos. I’d come prepared with a few coppers as well as the bigger coins, so handed over a 50c, a 10c and a 1c. “No” she said. I took another look – had I got the coins wrong? Or misheard the figure? She handed back the single centimo. “No es necesario” she smiled – it’s not necessary. It’s true that many shops can’t be bothered to either accept or return the tiniest coins, simply rounding everything up or down. But then why did she ask me for 61c? I wondered fleetingly if their tills ever balance at the end of the day.